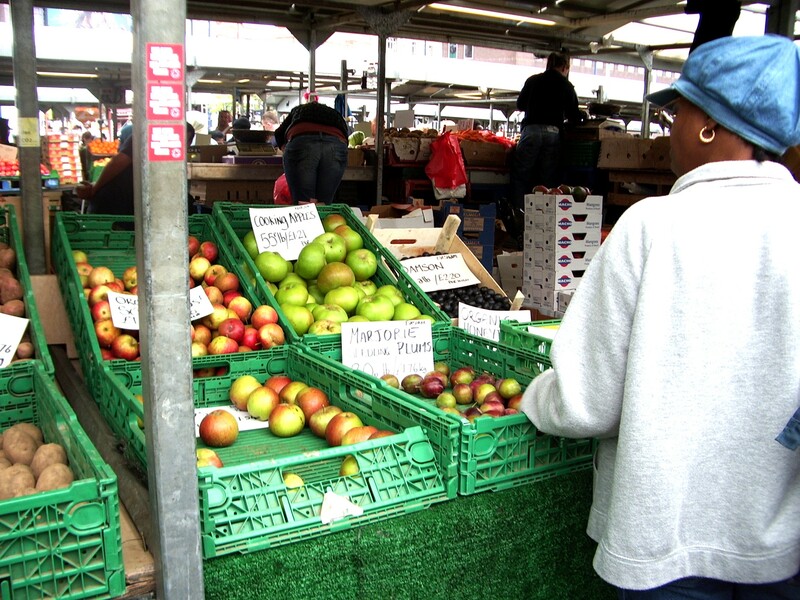 John Lerwill’s website tells us that the market began in 1154 when Peter de Bermingham, a local landowner, obtained a Charter of Marketing Rights from King Henry II to hold a weekly market every Thursday and levy tolls on goods and produce sold. Richard I confirmed this right in 1189 in a charter enrolled and placed on the Patent Rolls, now in the National Archives. Later the area was known as the Bull Ring, because the ‘sport’ of bull-baiting took place on the site The market‘s location, where trackways in the area converged and there was a crossing point on the River Rea, made Birmingham a centre of trade and attracted skilled craftsmen. A major cloth trade was established and over time other markets developed nearby including food, cattle and corn markets. The Bull Ring developed into the main retail market area for Birmingham as the town grew into an industrial city and there were demonstrations and speeches from leaders of working class movements during the political reform movements of the1830s and 1840s. Its first MP, Thomas Attwood, having seen the effects of growing unemployment upon ‘an affectionate people’ in Birmingham, warned that: ‘Poverty has made them madmen; by coercion you may make them devils’. The building was faced with stone from Bath and its wide entrances were supported by Doric columns. At the end of the market day, metal gates were pulled in front of the entrances. In the centre of the large market hall was an bronze fountain, given by the Street Commissioners upon their retirement in 1851. On the inside of the bowl were eight lions’ heads from which water was ejected and in the centre was a 150 cm tall statue called the Messenger and Sons. The statue consisted of four children representative of each of Birmingham’s main four industries; gun making, glass-blowing, bronzing and engineering. 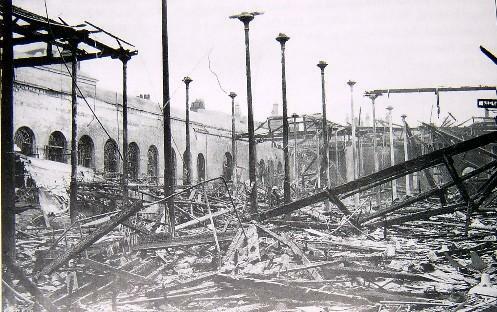 Nearby New Street was heavily bombed in World War II and the Market Hall was severely damaged. No repair work was conducted on the building and the arches which housed the windows were bricked up. 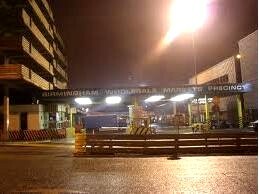 However, although roofless, it remained in use for small exhibitions and open markets until the redevelopment of the Bull Ring in the early 1960s. Demolition began in the late1950s and the outdoor market area was opened in June 1962 with 150 stalls, most selling, food and the demolition of the old Market Hall began. The London and Edinburgh Trust (LET), who had bought the land planned a second redevelopment in the 1980s but their proposals were changed by a pressure group called Birmingham for People and eventually the designs were amended. However, a recession meant that the plans could not begin construction.